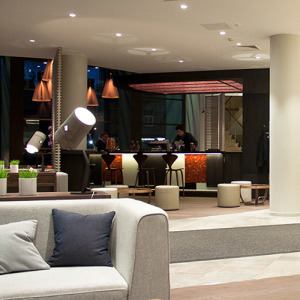 Eleven years into operations, business is thriving at the Holiday Inn in Vilnius. And behind the success and increasing business you find a daring mindset and an ambition to truly see every single guest, every single day. Geert Snaet, Regional Director Baltic States, has been in charge of the four-star Holiday Inn in Vilnius, Lithuania for five years. With its placement, in the middle of the city’s business district and with easy access for car travellers, the hotel has a steady flow of corporate customers, guests to the surrounding local branches of international companies. However, this only constitutes the hotel’s reality Monday to Friday. On weekends and during the summer season, a new set of challenges appears. "Well, during the weekends and during the 3 to 4 months of summer, we try to adapt and become a more leisure-centred hotel. That means catering to 'regular' tourists from Central Europe, the Nordic countries and Asia. We’ve seen an increase over the last two years in leisure tourist guests, which of course is very positive," says Geert Snaet. The style and type of guests may vary. What stays the same at The Holiday Inn, no matter what, is the way the guests should feel. "How the staff treat the guests is the single most important thing. To make someone feel welcome, to make them feel at home we always go to extreme lengths to treat every individual with a personal and caring attitude. A stressed businessman will never return to a hotel where the only interaction and human contact he or she experiences is when someone asks for the credit card. We always ‘see’ our guests, ask about their well-being and if they had a good night’s sleep. To bring that, every day, to every single guest is our daily challenge." The importance of the attitude is paramount. Geert Snaet has implemented extensive training programmes and made sure the staff attends courses to further add to their people skills. The right way of doing things is mapped out, in writing. "We want our staff to be honest, fair, have a high level of confidentiality and treat everyone equally. I empower my personnel and allow them to make their own decisions based on this philosophy and so far the result has been excellent with increases in business." Apart from a personal approach to the hotel’s guests, the overall looks of the hotel, the design aspect, is something that has led to an increasing number of positive comments on travelling sites like TripAdvisor. And the choice of Tork as a supplier fits like hand in glove. 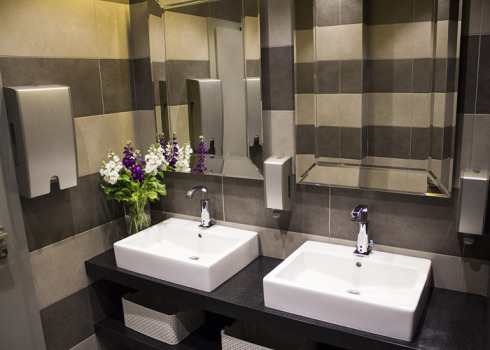 "We just finished a big renovation of the hotel and one key consideration for us were the washrooms. We know how important they are for the overall impression of the hotel. The architect in charge chose Tork, since we found that the design and the functionality of the products are a perfect match for the feeling that we want to convey to our guests. The whole set-up for the washroom was decided quickly, in as easy a manner as possible and we a very happy about the result." You’ve claimed that you try to do things differently, compared to other hotels in the area, that you’ve employed an ‘outside-the-box’ way of thinking. In what way will that be apparent for your guests? "Well, we always try to do things our own way. As an example we bought one of the cows from the CowParade art project and placed it in our lobby, something that led to a lot of positive comments. Instead of Easter eggs in the lobby, we opted for live Easter bunnies … But, again, the main focus, the main reason people come back to us is that we see everyone, we never miss out on acknowledging and paying attention to every single guest."